Remove the top of the bell peppers by cutting down about ¼-1/2 inch. You'll also "scoop" the insides out including the white pulp. Set aside.If you have cooked beans on hand, use those, if no you can use canned beans well rinsed.Cook lentils to the package directions- about 1- 1½ cups water boiled and add lentils, cook for 25-30 minutes or until tender.In a large mixing bowl combine all the beans, chopped veggies, and seasonings (everything except the avocado). 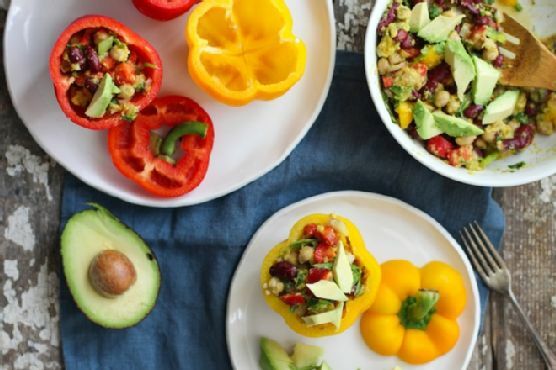 Toss until combined and adjust seasonings to your desired taste.Using a large spoon, scoop the bean salad into the raw bell peppers.Top with fresh diced avocado before enjoying!